Sunday evening meal. Like to make it a special one. Sunday nights should be special. Everyone gearing up for the week. We were having italian sausages simmered for several hours in tomato sauce over pasta and we wanted some fresh bread (or as Frankie calls it: "Papa's good bread") to go with the meal, but after a long day of parenting, I was bushed. I read a book a while back called No Need to Knead. Her basic premise is you get more rustic looking breads (big irregular holes and such) with less kneading. I don't think the premise is valid but it sure sounded appealing when I wanted a fresh loaf. So I weighed out water (200 g, warm tap), a T or so of honey, 1-2 t of dry yeast, olive oil (2 T) and swirled the mixture in my plastic bowl I use for raising dough. Then, I tossed in unbleached white flour (300 g) and salt (5 grams) and mixed the mixture with a metal spoon until it came together, and mixed another couple turns and closed it up (this container I use has a 2 mm diameter hole in the top for venting the gas) and went to wrestle Frankie. Within an hour and a half, it had risen nicely. I sprinkled on some flour and squashed it down. It wasn't as sticky as I thought it would be. I let it rise a second time only about a half hour. Then I plopped the mass into a 10 inch dark, non-stick cake pan (oiled lightly) and preheated my oven to 450-deg-F. I pushed the blob out to fill the pan, Frankie painted the surface with oil, I sprinkled rosemary and coarse sea salt on it and let it sit uncovered for 15 minutes. Then, I docked it and pushed it in the oven for 15 minutes. Wow. 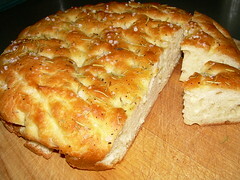 What a focaccia for very little work! However, it was very soft. Very flavorful but very soft and chewy. A great bread but don't know if I'd like it as a staple in our repertoire of breads. Definitely fit the bill for an exhausted parent.